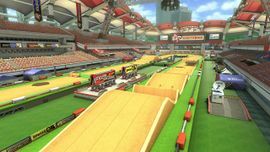 Excitebike Arena is a racecourse included with The Legend of Zelda × Mario Kart 8 downloadable content in Mario Kart 8, as well as the base content of Mario Kart 8 Deluxe, as the second course in the Egg Cup. As its name implies, the course is strongly based on the NES game Excitebike. Screenshot showing some different patterns of the elements of the track. The racecourse is simply a huge oval (much like Baby Park, but longer and larger in its width) with many ramps and mud spots, much like original Excitebike tracks. Signs featuring the Japanese & European box art for Excitebike can be seen throughout the course, as well as a large statue of an 8-bit biker sprite on one end of the track. This track is unique in the fact that the track changes every time a race starts. There are many different segments with jumps, ramps and mud spots that change position and height; according to Mario Kart 8 director Kosuke Yabuki, there are over 200 different patterns of such elements. A standard pattern is used on time trials. The staff ghost for this track is Mario on the Standard Bike. The time is 2:06.483. In Mario Kart 8 Deluxe 200cc, the staff ghost is an Inkling Girl. The course, as seen from the starting line. A view of the racers, mimicking that of the original Excitebike. Mario and Luigi, jumping off a ramp. Tanooki Mario, racing on the course. Cat Peach, performing a trick. Princess Peach, racing on the course. Peach about to drift around a corner. Peach performing a jump with the Excitebike screen in the background. Roy Koopa performing a trick. Rosalina at the starting line, ready to race. The opening animation during the countdown to the race is the lowering of the bars, which allow the characters to drive, like the starting line from the Excitebike series. This is one of five courses to have an opening animation during the countdown (the others are Electrodrome, Twisted Mansion, Bowser's Castle and Mount Wario). During its debut trailer, all of the characters except for Yoshi are given bikes as a reference to the game the track was based off. This is one of three nitro courses in Mario Kart 8 without anti-gravity sections with the other two being Animal Crossing and Super Bell Subway. It is also one of three courses without any gliding, underwater or anti-gravity sections, the others being GCN Yoshi Circuit and SNES Rainbow Road. Out of those 3 tracks, it's the only one that is a Nitro Track. The music for this course is featured in Super Smash Bros. Ultimate as a track. ↑ Mario Kart 8 Director Talks DLC, Hyrule Circuit Secrets, and More -- Interview. GameSpot (November 18, 2014). Retrieved November 18, 2014. This page was last edited on December 8, 2018, at 02:43.